Selecting the right metal powder is a vital consideration in Additive Manufacturing (AM), as the quality and properties of the powder strongly influences the properties of the end-component. Simply put, there are three major aspects to consider: selection of raw material, particle size and morphology. Sandvik is a world-leader in metal powder for additive manufacturing and offers the widest alloy program around – and can even customize materials. To get optimum results and uniform part build in additive manufacturing, it is essential to use high quality metal powders with good flow characteristics. Based on more than 150-year material knowledge and in-house powder manufacturing capabilities, Sandvik is expert at matching material to print process and application. Why did you select titanium powder to build the guitar body? “For the smash-proof guitar it was important to choose a material which enables both lightweight and strength. One of the most notable advantages of titanium is its strength. It’s among the strongest and most durable metals on the planet, which is why it’s used in so many industrial applications. In fact, titanium has the highest strength-to-density ratio of any metallic element on the periodic table”, says Keith Murray, Business Development Manager and Powder Expert at Sandvik Additive Manufacturing. “With Powder Bed Fusion Laser processes, when applying fresh powder layers to the powder bed, the good flow and high packing density that our metal powders offer will ensure uniform and consistent part build”, says Keith Murray. The lightweight and strength of titanium is also well highlighted in aviation where the use of it in landing gear and compressor fans has drastically improved thrust to weight ratios. Titanium is also highly recyclable – and it is also biocompatible making it well suited to medical usage. It’s also worth mentioning that titanium is generally more expensive than other types of metals. 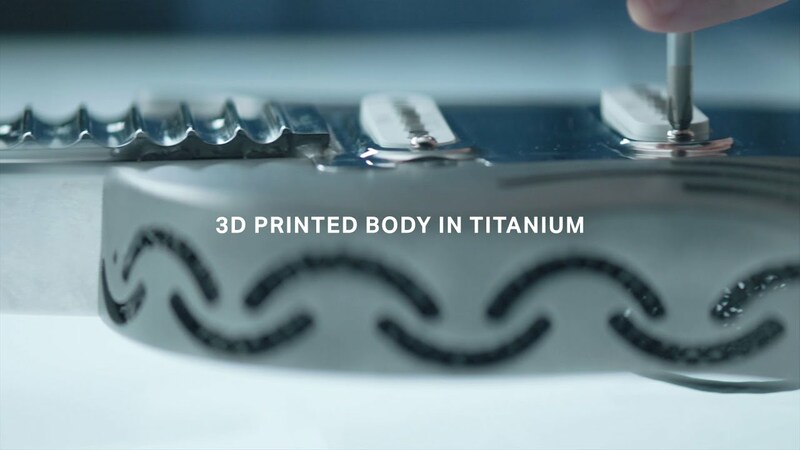 That is another reason why additive manufacturing is excellent as the choice of production technology when it comes to titanium, since it minimizes material waste. Why are Sandvik’s powders so well-suited for additive manufacturing? “For more than 15 years, Sandvik has been developing and selling world-leading gas-atomized AM-powders under the Osprey™ brand. Thanks to their spherical morphology, our AM-powders offer excellent flow and high packing density. These characteristics, along with their low surface oxide levels, make them ideally suited for all additive manufacturing technologies”, says Keith Murray. The printing technology selected for the body of the guitar was Powder Bed Fusion Laser. Can you comment on that? Powder Bed Fusion Laser was selected as printing technology for the body of the smash-proof guitar. This method is ideal for design of very complex geometries. Laser technology is used to melt and fuse the titanium powder together. The melting process is repeated, layer by layer, until the last layer is melted and the printing is complete. Then the body is removed from the build plate and post-processed according to requirements. Sandvik has nine gas atomization towers in-house for manufacturing of fine metal powders (seven in the UK and two in Sweden) – and can offer everything from developmental batches of 1 kilo to 6000 kilos lots. “Particle size can be adapted to fit any printing technique, from 5 to 500 microns”, says Keith Murray. Before any print project, each batch of new powder is analyzed in Sandvik’s fully accredited metallurgical and powder laboratories. This is also critical for success. “Quality variations can negatively impact the printing process. Our metal powders offer the same consistent high quality, both within batches and from batch to batch. Our customers can just tell us about their process requirements and end-applications – and then we can help them to tailor the particle size distribution range to optimize both performance and surface. We can also customize materials according to specifications”, says Keith Murray. Sandvik is right now ramping up additional capacity for titanium powder in Sweden.